Just over halfway to its planned height, the Tokyo Sky Tree became the tallest structure in Japan on Monday when construction reached 338 meters (1,108 feet). When completed, it will stand 634 meters (2,080 feet). 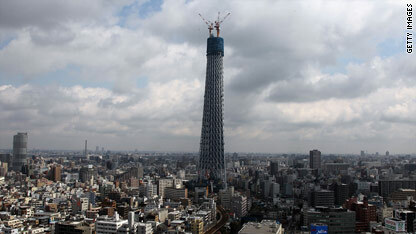 The Tokyo Sky Treewill stand at 2,080 feet when completed. The Sky Tree on Monday surpassed the city’s 333-meter (1,092-foot) Tokyo Tower, a landmark and top tourist attraction since it opened in 1958. Both the Sky Tree and Tokyo tower are designed for television and radio transmission. The Sky Tree’s towering reach will enable transmission of digital signals well above skyscrapers that rise above 200 meters (600 feet) in Tokyo, according to the Sky Tree’s Web site. When complete, the Sky Tree will have observation towers at both the 350-meter (1,148-foot) and 450-meter (1,476-foot) levels. 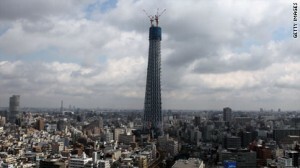 While the Sky Tree will be the tallest structure in Japan, it won’t be the biggest in the world. That honor falls to the Burj Khalifa tower in Dubai, which rises more than 800 meters (2,625 feet) above the Persian Gulf. Construction is expected to be completed in December 2011 with a grand opening in spring 2012.